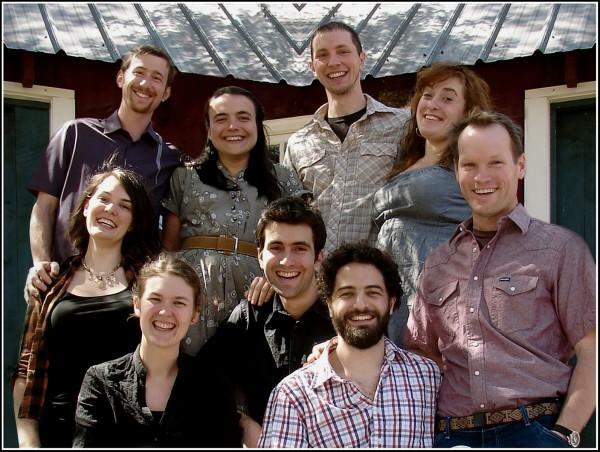 The Starry Mountain Singers are not your typical a cappella group. Instead of beat-box-heavy vocal arrangements of Top 40 hits, the eight-piece ensemble—whose members hail from states as far afield as Vermont and North Carolina—specializes in singing traditions from the United States, Bulgaria, Corsica, and Georgia. They eschew virtuosic soloing as well as any pretension of hipness, reveling in lush, complex harmonies and the power of many voices combined. I went to see the Starry Mountain Singers last Wednesday at the Unity Church of God in Somerville, MA, where a small but enthusiastic crowd gathered in a narrow, brightly-lit hall. There was no one taking money at the door, only a little collection bucket with a sign denoting the fare. It was an appropriately wholesome gesture from a group that sang with such warmth and intimacy, and who addressed the audience in kind. The eight singers, three women and five men, fresh-faced and casually dressed, opened with the toe-tapping gospel number “Working On A Building,” and then proceeded to blaze their way through an extensive set list that included shape-note songs, Corsican chants, Bulgarian folk songs, Georgian liturgical hymns, American country and bluegrass songs, and one original number. Though the material was anything but showy, it was nevertheless executed with exquisite precision, a multitude of voices swelling and ebbing in a series of perfectly-pitched waves. A stately Corsican chant, spreading slowly with chilly, minor-key beauty, gave way to the upright stride of an intricate shape-note song, followed by the delicate melancholy of a Bulgarian lament and rounded out in a big gospel finale, ringing through the hall with blithe, eager delight. Though much of the Starry Mountain Singers’ repertoire is overtly religious, the spirit that binds them is far more mundane. It is, quite simply, the joy of singing together, and the Starry Mountain Singers prove that this is an activity worth witnessing as much as it is doing. After all, there is a special vicarious pleasure to be found in hearing groups of people sing, unadorned by instruments and unfiltered by audio equipment. It’s the voice, the most human of instruments, multiplied and expanded—a giant, harmonious organism with many mouths, and one killer set of lungs. This entry was posted in A Show I Went To and tagged a cappella, choral, folk, music, world. Bookmark the permalink.